"Manage and create email campaigns quickly"
Excellent tool that provides the possibility of creating mail campaigns to send to different types of customers or companies and also allows to observe the reports and statistics of all of them. It is one of the email marketing easier to configure and shows very detailed results, so if you want to make successful campaigns can help you a lot. The mail campaigns and the management of communications with customers are basic in a company, this software allows you to reduce the time spent on it and shows you very complete reports of the results. I think CleverReach is a great tool to organise your newsletter-marketing via email. It easy to use and you can use it for a good price. You can create a email-blacklist for all user, who will not receive a newsletter in the future. You can create different templates in different styles. And it is really great, that you will get a report for each Newsletter-Campaign you have sent in the past. You can report every article in your Newsletter and see the clicks for earch topic. And you can track your campaigns in Google Analytics. You only have to use the Parameters utm_source or utm_medium. Some more option for creating different email-templates could be great. It is a great tool for every business-size. A lot of interesting optons for a good price. I used CleverReach in the past for some different newsletter-campaigns. I sent a lot of different newsletters to different users (be sure that you have the double opt in from the users). For each Newsletter you will get a special reporting with interesting KPIs like Open-Rate, Click-Rate, Bounce-Rate and so on. And if you want to track the Newsletter-Campaign in Google Analytics, you only have to use the special Google Analytics Parameter like utm_source or utm_medium to get your Newsletter-Data into Google Analytics. 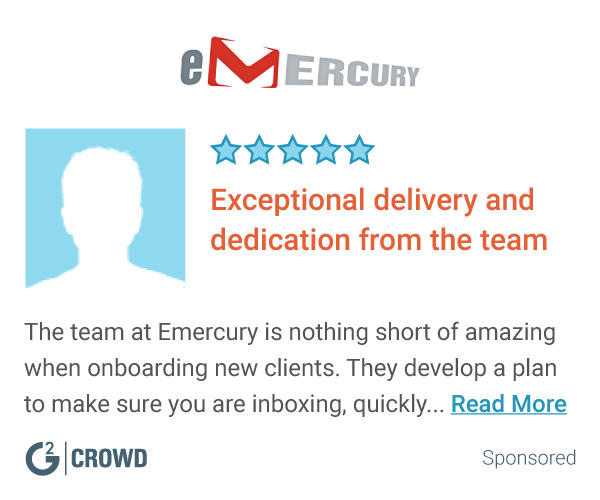 "Powerful Email Marketing that is one its way to automation"
I like best the clear user interface and the ease of use. Plus I really like the auto responder functions and the new beta automation feature. I dislike the limited automation feature. I know it is still in beta, but I think there are plenty more cases that should be built into this promising feature. Cleverreach is definitely worth a try. It gives two options for paying. One is email-based the other is user-based. The UI is really easy to understand and I doubt there will be major problems in using the tool. One think you should be aware of: The email support is not free. It is 5 Euros/month. We use this tool for all our marketing email communication and for sending out automated triggered emails like newsletter registration confirmation emails or surveys. It is really adding value to our comma team and it is pretty good in doing so. "An easy and effective web based email marketing program. " It has a nice interface which is very easy to handle. The options given on the dashboard are very easy to understand and operate. Users can link subscriber forms along with the email. They don't have any mobile app of this software. Sometimes I need it to use on my mobile device but it's not possible to use web version on mobile browsers. I would recommend this productive tool for weekly or monthly newsletters. It will also help users to increase subscriber base. It is very helpful in sending monthly newsletters to my clients and associates. "Useful application for responsive newsletters." The best thing in it is its accuracy. I use this application to send responsive newsletters to my specific set of clients. And this application never disappoints me in terms of responses with highest accuracy. I found its pricing very high. For a startup it is really expensive. And for a trial purpose they should give a more credits. It is very much required to experience their services. This application helps me to convey important informations to my clients in a newsletter. With the help of these responsive newsletters I get clients interest for my products. "Clever and efficient use of a single tool to both create and distribute newsletters to thousands "
The ease with which I can empower my primary pet peeve of creating enticing newsletters whilst offering a helping hand in managing and automating my fortnightly emailers. Another silent highlight is the amazing feature that helps replace non existent email ids and duplicates. To a marketing ameture like me that misses 10 checklist points whilst managing 5, this software with its once set guidelines half of the TO-Do’s are done. "Great Insights, Great Marketing Tool"
Ease of use, Insights and API-Access are musts for a newsletter-marketing tool. Templates are easy to manage and edit. Still, if you need to, you can code whatever needs to be coded. CleverReach is sometimes quite complex and things seem not to be where you might think they are. Try the responsive templates, this will boost your clicks and conversions. Reach subscribers, measure & co.
CleverReach helps a lot of people get what they need, and is one of the leading international email marketing companies out there. What I dislike about CleverReach is that they need to fix some of there programs. I recommend using it it's a great product for marketing and sales. The business problems that I'm solving is to work harder and get more people with CleverReach. Benefits that I've realized is that is to solve each problem that I have with CleverReach. I love that CleverReach is free and very easy to use. The program makes sending mass emails a breeze compared to some other programs. I haven’t found anything that I disliked about CleverReach! It’s a great program. I was able to send out mass emails to many of my clientele all at one time rather than sending them individually. This made my business run smoothly! I like using clever reach for our company surveys - we send out once a quarter and are very easy to setup. While setup and adding lists is easy, there aren't as many templates to chose from. We need a bit of automation when setting up email surveys, and clever reach allows us to do that. Clever reach is great for accessing the desired consumers and providing my business with a reach of people that we are intending to sell to. There are similar programs that are more cost effective. We have acquired new consumer reach through this program and are growing our business as well as its reach on social media. "Reliable and competitive Email Marketing Software"
CleverReach has a lot of options incl. automation. You are able to customize all the steps from subscription and cancellation. It has a lot of templates and API solution for many applications like Joomla etc. The reports are great and there are a lot of Segmentation possibilities! Not always easy to use. The navigation should be improved. At the begiinning it takes some time to optimize it. But you can start and implement it within one day. There are 4 pricing plans: free plan, monthly plan, higher volume plan and a prepaid plan for accasionally Mailings. * We monitor all CleverReach reviews to prevent fraudulent reviews and keep review quality high. We do not post reviews by company employees or direct competitors. Validated reviews require the user to submit a screenshot of the product containing their user ID, in order to verify a user is an actual user of the product. Hi there! Are you looking to implement a solution like CleverReach?